Not all yellowjackets build their nests attached to building eaves. Some prefer to go to ground or enter through holes that give them access to attics inside buildings or beneath raised foundations. If you find yellowjackets inside your home, especially after the first frost or freeze of winter, more than likely they have built a nest inside the attic of your home that they access through screens below the eaves or small cracks in the building. 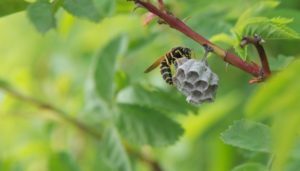 If you come upon a ground nest and it’s far enough away not to bother the people in your home, it’s best to leave the nest alone, as wasps feed annoying insects to their young. Each type of wasp builds a nest slightly different from the nests its cousins build. Some nests have a rounded appearance like a balloon with an entrance hole at the bottom. Bald-faced hornets nests resemble a gray wineglass hanging from the lip of the cup part attached to a building eave. A long cylindrical stem drops beneath the cup of the nest to allow access inside. Paper wasp nests resemble the honeycomb look that bees create with each papery cell supporting a new wasp. Their nests are circular and somewhat flat, no taller than a wasp’s length. Mud daubers build small mounds of mud attached beneath eaves that harden to a gray or brown, depending on the mud color in your neighborhood. Wasps are beneficial creatures, offering some of the same benefits of bees: pollination. Besides pollination, young wasps eat a lot of insects such as crickets, spiders, caterpillars and flies – bugs that turn into pests in your garden or inside your home. Adult wasps feed on sugars in ripened fruits while paper wasps feed on nectars. Some yellowjackets, mistakenly called meat bees, hover around a barbecue and like meat. Late summer barbecues near a yellowjacket nest make for an unpleasant meal.